I love these new Martingales in the smaller sizes – Henry has one – with a matching lead – and he has really taken to it . 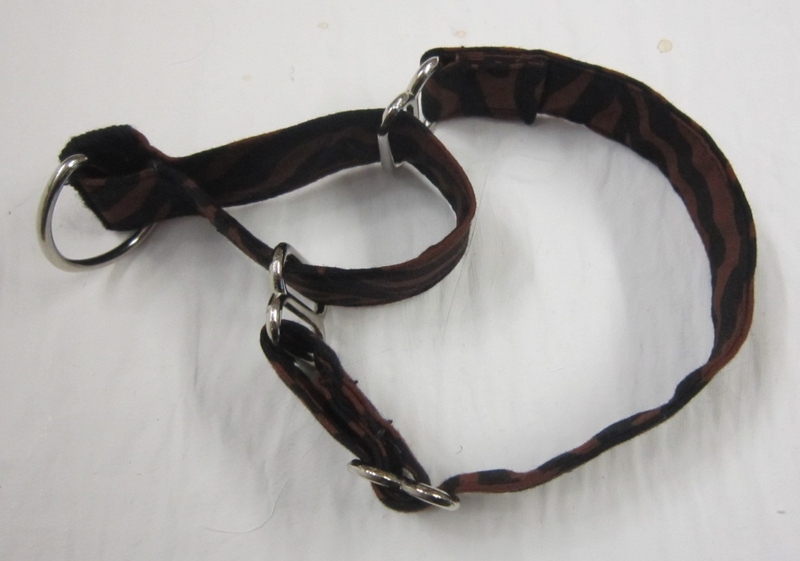 Fabric Martingales are wonderfully soft on the dog’s neck – and with all the layers of fabric and interfacing I use – they are surprisingly strong! I hope to add more in different sizes and fabrics – so keep your eyes peeled and jump in when you spot one you like. All the Posh Dog range is handmade in The Lake District by me. Each item is unique – the length, colours, style vary with each collar. Please double-check the details and length before you order to avoid disappointment. I use only 100% printed cotton fabric for the collar and lead outers and a fusible, non-woven, light weight, synthetic interfacing on the back of the cotton fabric. Interfacing is an additional layer applied to the inside to stabilise and strengthen areas. It has an adhesive on one side which bonds permanently with the fabric. Handmade Posh Dog Collar 0022.